Oradea, located in the northwestern part of Romania, is the tenth largest city of the country, and the seat of Bihor County. Geographically, it is situated at the crossroads between the trading route which linked central, eastern, and south-eastern Europe to the Orient. The modern city extends from the foothills of the western Carpathian Mountains and expands along the banks of the River Crisul Repede. Today the city's population numbers 210,000 inhabitants, consisting of about 70% Romanians, 26% Hungarians, and a little over 2.1% other, including Germans, Jews, Slovaks, Gypsies, etc., according to the city's official website. Oradea is undergoing modern day economic development, but more significantly, since the demise of the communist regime in 1989, a great deal of social and cultural changes as well. The city has a rather complicated and controversial historical background due to its location and the diversity of its population. It has been known by several names: Varadinum, Grosswardein, Nagyvarad, and Oradea -- each name used during a particular historical era, depending who ruled the region. In the Western world, that region is better known as Transylvania. One thing is certain: the city is quite old. According to Romanian data, the area was inhabited as early as 2200 BC; according to Hungarian data, Oradea was established as a Roman-Catholic Bishopric during the reign of King Ladislaus I, having been mentioned as early as 1113. It knew the Tartar invasion in 1241, the Turkish rule between 1660-1690, the Hapsburg Empire from 1692. The next 200 years was an era of many changes for the settlement, encompassing revolutions, uprisings, brief periods of independence, only to be followed by two world wars and a communist regime, whose demise followed the Romanian Revolution of 1989. The city's population and development were sharply and directly affected by the swift annexation of the region during upheavals, to either Hungary or Romania. To stay with modern history, following the defeat and disintegration of the Austro-Hungarian Empire in 1918, Transylvania was awarded to Romania by the Peace Treaty of Trianon. It remained so until August 30, 1940, when by the terms of the second Vienna Awards, the Northern part of Transylvania, including Oradea, was awarded to Hungary, while the Southern portion of the region remained part of Romania. Following the defeat of Nazi Germany in World War II, Northern Transylvania, including the city of Oradea, became once again an integral part of Romania. Jewish presence in the region, according to Daniel Lowy's research, dates to the Vetch century, more precisely to a document of 1489, which mentions a person named "Judeo Joza de Varad nunc Bude." The establishment of the Jewish community is mentioned in written documents of 1722, and by 1733 we learn about the creation of the Chevra Kadisha. During this time, Oradea consisted of four independent town-states: Velenta (Velence), Subcetate (Varalja/Lower Fortress), Orasul Nou (Uj varos/New City), and Olosig (Olaszi). Later, in 1849 they unified to become the municipality of Oradea Mare (Nagyvarad/Greater Oradea). Due to severe restrictions on settling or renting, Jews were first permitted to live in mud huts they constructed in the wastelands around the Fortress. In the beginning, they settled between Velenta and the Fortress. The 1735 conscription documents show Jews living also in the New City and Olosig districts. 1781, the year when Emperor Joseph II passed the Act of Tolerance, marked important changes in the laws affecting Jews. They included the right of enrolling Jewish children in all religious and public schools, gave Jews the right to work the land and practice many professions forbidden until then, and it mandated using German as the official language, Hebrew being reserved only for use in religious services. In 1783, the Superior Council of War made a decree regarding the Fortress of Oradea. It was decided that the army no longer needed the Fortress and the surrounding area was to be subdivided for residential dwellings, among them dwellings for the Jews. This district known as Subcetate, by 1792 became home to 46 Jewish families, of which more than half owned their housing. The political upheaval of the 1800s affected the Jewish population of the city. Many Jewish men participated in the Revolution of 1848 as volunteers in the Revolutionary Army. Although Jewish Emancipation was proclaimed in 1849, Oradean Jews did not benefit from it right away. Rather, they suffered under the following absolutist period. Still, the Jewish population of the city increased steadily, to over 1400 by the middle of the century. After an era of prosperity at the turn of the century, the Jewry of Oradea participated along with everyone in the country in the hardships imposed by World War I. Schools and the Jewish hospital were placed at the disposal of the Army, while Jewish men from Oradea and Bihor County fought as soldiers in the Austro - Hungarian Army. Some distinguished themselves in warfare and earned medals, as listed in Tereza Mozes's book "Evreii din Oradea" (Jews of Oradea) including Vilmos Acs, Dr. Peter Vali, Dr. Bela Fleischer, Dr. Pal Ney, Dr. Bernat Grunstein, Dr. Bertalan Stern, Sandor Friedlander, Andor Sonnenfeld, Gusztav Sonnenfeld, Sandor Korda, Sandor Meer, Miklos Stern, Dr. Albert Feld, and Rezso Molnar mentioned in Daniel Lowy's chapter. Many others died or were taken prisoner, and still more were wounded. Both grandfathers of this author were surviving veterans of World War I, only to become victims in Auschwitz some thirty years later. Following World War I, according to the terms of the Peace Treaty of Trianon signed on June 20, 1920, Transylvania became part of Romania. Luckily for Oradeans, the transition was peaceful. In the beginning of this new era for Oradea, the Jewish population adjusted reasonably well. Through continued hard work and the possibilities offered in the beginning by a fairly liberal government, they were able to prosper. They created new factories and enterprises, such as the Oradea Weaving and Textile Factory of Iosif Silbermann, the Comb Factory of Farkas Ripner, and the Drugs and Chemical factory of Armin Meszinger. Important establishments from this era, including the Steiner Family Bread Bakery, the Derbi Shoe Factory owned by Farkas Moskovits, and N. Steiner's Carmen Shoe Factory, although renamed since continue functioning to this day. The relatively quiet life of Oradea Jews was painfully disturbed in the summer of 1927, when a group of highly nationalistic and fascist-spirited elements created an organization called Legiunea Arhanghelului Mihail (The Legion of Archangel Michael), also known as the Iron Guard. The organization's main duty was to preserve Romania and the Romanian people from the overwhelming presence of foreigners (Jews) in all aspects of life. They agitated against Jews and later also were able to influence the government. In December 1927, Oradean Jews were to find out about Romanian anti-Semitism directly, during the National Student Congress organized in the city. Romanian students, who besides openly discussing and demanding the exclusions of foreigners (Jews) from schools and universities, organized terrorist acts against the Jewish community. They beat up over a hundred Jewish people in the streets and vandalized synagogues and Jewish facilities. The political situation worsened in the mid 1930s, after the creation of the Partidul National Crestin (Christian Nationalist Party), which had as its primary program the introduction of national anti-Semitic policies. Jewish rights were becoming more and more restricted up until August 30, 1940, when following the second Vienna Awards, Oradea became part of Hungary. This was the time when the most vicious anti-Jewish laws were passed by the Hungarian State. From then on, the situation of the city's Jewish population worsened by the day. Starting in the summer of 1942, Jewish men between the ages of 18 and 45 (later up 58) were taken to forced labor battalions, where they were assigned menial, difficult and dangerous jobs as servants of the Hungarian Army. Unarmed, they were often sent ahead of the army as scouts to discover land mines. A great number of them perished during such operations, as well as due to the harsh, inhuman treatments by the Hungarian commanders. It is important to mention though that there were a very few exceptions among those commanders who behaved compassionately with the Jewish men - for example, Lieutenant General Imre Reviczky, as well as Lieutenant Istvan Toth of Oradea. Meanwhile, back in the city, government adopted laws included confiscation of Jewish businesses and exclusion of Jewish employees from their place of work. Signs appeared in store windows stating that they don't serve Jewish customers. On April 26, 1944, the government decreed the seizure of all Jewish personal property and residences, which meant the final loss of personal freedom as well. The total population of Oradea in 1944 was about 90,000 people, including roughly 30,000 Jews. Within a few days' time, by the first week of May 1944, the Hungarian authorities squeezed with great precision the Jewish population of the city into a ghetto set up in an already crowded poor district. They also brought in approximately 8,000 Jews from the County, whom they placed in a separate ghetto, without a roof over their heads. The Oradea ghetto became the second largest in Hungary, after Budapest and the living circumstances of its inhabitants were beyond imagination. Many died and many committed suicide. This is how Bela Zsolt described in his memoirs the daily life in the ghetto: "The dead were not only left out of the register but also out of the earth. As the cool and rainy night was followed by stifling heat, the stench of the bodies became unbearable. The ghetto hardly noticed it - we had become amazingly used to the characteristic odor produced by the decomposing dead, the disgusting latrines, the overflowing drains..." After beating, terrorizing, starving and robbing the ghettoized Jews of their last personal assets, and after spreading misleading information about taking them to work in the Transdanubian region of Hungary to keep them better under control, between May 25 - June 3, 1944 the Hungarian gendarmes and officials instead crammed them into cattle wagons. They forced 80 to 90 people in each wagon designated for five to six animals and provided them with one bucket of water per wagon for the four-day journey to the extermination camp of Auschwitz-Birkenau. Only a few people in the typhus hospital were left behind to be shipped after their quarantine period was over. The possibility of escaping from the ghetto was almost impossible and afterwards improbable, as the great majority of the city's population was unwilling, afraid or uninterested in helping Jews. 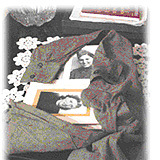 Still, there were people, both Hungarian and Romanian, who tried their utmost to help save Jews. Among them were the Appans, Rozalia Farkas, Julianna Szakadathi, Dr. Maxim Virgil, Gheorghe Mangra, Dr. Mihai Marina, Dr. Ion Iasiu, Dr. Lajos Szabo, Janos Opalotay, Janos Antal, Sandor Papp, Marta Szabo, Martin Tibulac - and probably others whose names we don't know. A virulent anti-Semite, acting Mayor Gyapai, who signed the deportation orders, escaped with his family just before the liberation of Oradea in October 1945, and later was admitted to the U.S., where he lived unpunished in Montana with his family until his death. When the war ended, about 2,000 survivors returned to the city, many in hope of finding other surviving relatives. For the majority of those survivors, the political Iron Curtain descended swiftly, trapping them inside a new totalitarian dictatorship. During a few open window periods of legal emigration, in the early 1950s, 1960s, and 1970s, the majority of the Jewish population left Oradea, resettling mostly in Israel, the U.S., Europe, and various other parts of the globe. Today, there are only a few hundred Jews living in the city, yet there is a functioning Jewish community, a cemetery, a kosher kitchen for the needs of the elderly, and a wonderful youth choir named Hakeshet. The Jewish population contributed in all aspects to the development of Oradea, in some areas much more extensively than their numbers would command. Through their religious practices, traditions, integrity, generosity, and general attitude to life, they became an asset to the city. Although their numbers have dwindled today to only a few hundred, the legacy of their achievements still stands clearly at nearly every step. It is not an overstatement to say that the Jewish population lived in peace with all other ethnic groups and participated in every important development in the city's history - including religious, spiritual, educational, economic urbanization, and cultural domains. The first rabbis who served the Jewish community of Oradea from 1776 to 1792 were Chief Rabbis Eliahu Zahlen of Yaroslav, Naftali Cvi Lipschowitz, and Yeremia. Rabbis Wiener Feis, Iosef Rosenfeld, Dr. David Wahrmann, and Aaron Landesberg followed. The first two large synagogues, in baroque style, were built in 1803 and 1851, respectively - the Old Synagogue and the New Synagogue, with a capacity for 1,000 people. These synagogues, both located on today's Calea Clujului (Kolozsvari u. ), were demolished during the communist regime. After the Jewish Emancipation, the Hungarian and Transylvanian Jewish Congress convening in Budapest requested the codification of a unified Jewish temple. However, among the delegates it came to be known that many coreligionists already practiced a more "reform" type of Judaism than the Orthodox rites demanded. From 1847, a Prayer House led by Dr. Lipot Rokkonstein functioned in Oradea. The Oradea Reformed Hebrew Union was created in 1848. In 1861, the first Neolog Jewish Community comprising about 220 families was founded, where worship was conducted in the Hungarian language. The members of this community considered themselves as Hungarians of Jewish religion. Still, in 1865 the Oradea Jewish Community reunited all Jewish religious orientations. The reformists continued to insist on changes, which led to the convocation of another Congress and the final breakup of the Oradea Jewish Community. Representing the Orthodoxy was Chief Rabbi Landesberg; the Reform (Neolog) Community had Chief Rabbi Sandor Rosenberg at its helm. Meanwhile, a third, smaller community composed of disillusioned members from the other two groups formed and functioned until 1885. Its name was Status Quo Ante and its members were hoping for a reunification. Despite this drastic breakup, which touched the community as a whole, there were basic institutions, such as the Chevra Kadisha and the Hospital, which functioned as one. A magnificent Neolog Synagogue, with a large full-toned organ and a capacity for over a thousand people was built in 1878 in the center of the New City. This neo-mauric architectural monument became known to Oradeans as the Zion Temple and it has always been associated with its famous Chief Rabbi, Dr. Lipot Kecskemeti. Its shining imposing cupola, reflecting in the water of the River Cris, is to this day the city center's most recognizable monument. Today, this historic monument is in bad need of repair and it is not in use. In 1890, a new and imposing Orthodox Synagogue, also in neo-mauric style, the Great Synagogue, was built not far from the Zion Temple. By 1908, yet another smaller synagogue, known as the Sas Chevra, was built in the Great Synagogue's own courtyard. These days, while the Great Synagogue is used only for High Holiday worship and special commemorative occasions, the Sas Chevra is still in use for daily worship. Other, smaller houses of worship accommodating only hundreds of worshipers functioned within the different districts of the city. Among them were the Machzike Tora Association's Synagogue on the now demolished Heinrich Heine (Baross) Street and the Poale Cedek Temple in the New City on Tudor Vladimirescu (Koros) Street. There were also prayer houses and temples for Hassidic Jews and Sephardic Jews, as well as the so-called "private courts" of various famous rabbis, including the Rabbi of Visnicza. The beautiful Teleky Street Orthodox Synagogue, built in 1928, also in the New City in mauric style, was the last synagogue built in Oradea. In a state of disrepair, this synagogue still stands today and is being used as warehouse for a vegetable market. Among the rabbis who served the Orthodox community, the most famous was Rabbi Mor Fuchs, after whom until the 1960s they named the street where the Great Orthodox Synagogue is located. Following his death, his son, Benjamin Fuchs, served as Chief Rabbi. Dr. Lipot Kecskemeti, who served as Chief Rabbi from 1890 until his death in 1937, dominated the Neolog community. Dr. Istvan Vajda, who later died in a concentration camp, followed him in the rabbinical seat. The last two full time Orthodox Chief Rabbis of Oradea after World War II were Moses Pollak and Gavriel Schwartz. Today Oradea has no rabbi. In the late 1700s, children were instructed in cheders, Jewish religious schools, or by private instructors. In the latter part of the 18th century, the Imperial decree by which Jewish children could be educated in religious schools and all public schools had a significant impact on education. The first Jewish public school opened its doors in 1786 and functioned for nearly three decades under the leadership of Samuel Friedlander. The community school established in the middle of the 19th century, known as the Public Elementary School, taught four classes. In 1868, educator Adolf Auschpitz opened his private coeducational school, which later qualified as a public school. This school functioned until Mr. Auschpitz retired and bequeathed the school to the Neolog Synagogue. The Neolog High School functioned from 1920 until the deportations in 1944. According to the Oradea Memorial Book, in 1920 there were 203 regular students and 82 private students, the latter mainly girls, who after the closure of the Protestant School were left without a school to attend. Of the 203 students who graduated at the end of that first year, there were 147 "Israelites," 21 Catholics, 28 Protestants, and 7 Lutherans. In the following years, significantly more emphasis was placed on education in the Jewish spirit and the student body makeup became homogenously Jewish. The school had its difficult times, first due to lack of space to accommodate all the students, then because of the political situation in which the region was caught up. To be certified, the school had to make the transition in a short period of time from teaching in Hungarian language to teaching in Romanian. From 1930, the school was officially named Dr. Lipot Kecskemeti Jewish High School and until deportation, it functioned as a certified public school under the directorship of prominent educators, among them Dr. Izidor Szilas, who served during the last school year. Its recognition as one of the schools with the strongest curricula and best prepared teachers was further enhanced in 1941 following the implementation of anti-Jewish laws, when many university professors who were laid off in Hungary came to teach in Oradea. According George Liebermann, an alumnus of the last graduating class, students also received excellent physical education preparation from their teacher, 1936 Berlin Olympian Bela Lakatos, who "created a gym with the most modern equipment and trained four groups of strong, excellent gymnasts who had a better chance to survive." There existed a special camaraderie among the students in this school. Both teachers and school were much respected and loved by the students, and to this day, the alumni refer to it by its beloved nickname "Zsidlic" (abbreviation of Zsido Liceum / Jewish High School). Surviving alumni still hold regular reunions in Israel. After World War II, the School functioned for a while as an ORT school, then as a school for apprentices. Following the breakup between the Orthodox and the Neolog communities, the Orthodox community opened its own school in 1882 under the leadership of Chief Rabbi Mor Fuchs and the directorship of the highly educated and recognized writer/educator, Jakab Gabel. The school was known as the Gymnasium for Boys and later it moved into its permanent and final location, the modern two-story building on the Great Orthodox Synagogue's campus. It became a renowned institution of education, referred to as the Gabel School, accommodating students from far away. For instance, in the school year 1915-1916, of its 193 students, 104 were Oradeans, while the other 89 came from places which included Austria, Pozsony (Bratislava), Beszterce-Naszod (Bistrita-Nasaud), Sopron, etc. Today one part of this school is a Romanian state elementary school, the other a private Christian school. Nearby, a three-story building held the Girls' Orthodox Junior High School. Today that school houses the Hungarian Club of Oradea. The Commercial High School opened in 1888, and it accepted boys and girls. Although not a Jewish school, its student body was made up in great part of Jewish students. Oradea was known to have had Jewish doctors even during the Turkish rule. The Hakdesh, a public health care facility, was established in 1786, but it functioned for a long time without a doctor. The archives of 1797 attest in Latin to the existence of a Jewish school, bath, bar, and hospital. Although few, doctors were available and assured medical assistance to the sick, but they were not permanently established in Oradea. The first lay intellectual Jewish doctor born in Oradea in 1798 was Dr. Frigyes Grosz. He obtained a Ph.D. in 1819 in Budapest, then a degree of medical doctor and one of surgeon from the University of Vienna. Dr. Grosz settled in Oradea and had a very successful practice, treating not only patients who were able to pay their medical fees, but also the poor for free. In 1830, he established The Institute for the Visually Impaired Poor, a first in all southeastern Europe. The complex had several smaller buildings, over 20 rooms, clean fresh water, and a shower. It was capable of accommodating up to 60 patients. During his practice, this doctor treated over 30,000 sick people, regardless of nationality or social status. Dr. Frigyes Grosz offered the city an entire dynasty of doctors, including his brother, Dr. Albert Grosz; his son, Dr. Lajos Grosz (Csatary); his grandson, Dr. Emil Grosz; and son-in-law, Dr. Izidor Kalman. In 1856, the Hakdesh was transformed and rebuilt into a new hospital in the Subcetate district (Calea Clujului), with Dr. Frigyes Grosz as its first Director, followed by Dr. Lajos Grosz. In 1869, the hospital had to be completely renovated, but it was still not satisfactory for the needs of the population, as it often treated patients regardless of religion or financial status. Dignitaries started a fund raising action to build a new hospital, which finally was dedicated and opened on December 24, 1905, with Dr. Marton Weisz as its Director and Doctor in Chief, Dr. Jeno Polya, then Dr. Imre Fischer as Chief Surgeons. Among other doctors renowned at the time, it is important to mention Dr. Erno Schiff, the first Doctor in Chief and Director of the Children's Hospital, who also brought the first X Ray machine to Oradea. Dr. Menyhert Grosz created the first anti-tuberculosis Health Unit, while Dr. Rene Berkovits was the Doctor in Chief of the Oradea Garrison. Oradea had a large number of Jewish doctors, both before and after World War II. Enlarged and modernized, the once Jewish Hospital fully functions today as the Obstetrics and Gynecological Hospital of the city. Due to the ever increasing Tolerance Tax and various other taxes imposed on the Jewish population by Empress Maria-Theresa in the early part of the 1700s, Jews worked very hard and lived in poverty. Most of them were migrating merchants, others were very poor tavern keepers - occupations permitted to them, but only in the outskirts of the city. With time and more hard work, the economic situation of some Jews improved, meaning they were able to meet their taxes, while others lived from day to day. At the end of the century, during the reign of Emperor Leopold when some of these forbidding laws were relaxed, permitting Jews to work and rent land, work in trades and in manufacturing, their livelihood became somewhat better. In the early 19th century, Jews petitioned the court to further extend their permissions to engage in agriculture and also become manufacturers, tradesmen, and merchants. By 1851, they were allowed to become members of the Merchants' Guild and from then on their economic life improved significantly. They specialized in a variety of fields, becoming metal workers (bronze, silver, gold), tailors, shoemakers, candle manufacturers, glass blowers, watchmakers, etc. Traveling salesmen criss-crossed the land, bringing new merchandise to Bihor County. Those families who were in a better financial situation gave back to the entire city community when needed, as for instance after the flood of 1852, when they provided small rocks and sand to rebuild devastated streets. According to Tereza Mozes's research, the Hungarian Census of 1870 counted 6438 Jews; in 1880 their number grew to 8186, in 1890 they numbered 10115, and in 1900 there were over 12100 Jewish people living in Oradea. This growth showed that the economic situation of the Jewish population had improved. They were engaged in processing grains, in the food industry, were responsible for innovations, which they applied right away to boost manufacturing and keep it safe. In 1868, Ioan Grunfeld created the first omnibus line in the city that went as far as the Felix Resort. The Sonnenfeld family founded the first modern printing house around 1870 and Janos Roth established the first telephone network in the city in 1888. The first alcohol manufacturing factories were those of the Lederer and Kalman families. The Krausz-Moskovits chemical factory and the Moskovits shoe factory were also firsts in the city. In the modern wood processing industry, Imre Darvas became partner in the wealthy Swiss Alfred La Roche's company. Dr. Ferenc Berkovits created the modern water network and Izidor Schwartz directed the carbonated goods manufacturing factory, built with English capital. There were also smaller manufacturers who produced boxes, leather items, cotton, textiles, socks, ink, comb, caoutchouc, chemicals, livestock, etc. Among the first Oradean companies to be listed on the Budapest stock exchange were those of Wechsler and Farkas, the Eber and Jung textile companies, the Mihaly Leipnik, and Armin Glucksmann haberdasheries. Albert Vadas opened the first drug store, while Bernat Hirschl the first shoe store - both downtown, where still only very few Jewish families lived. In the same area, Hermann Friedlander opened a menswear store, Samuel Berger, Jr. a bookstore, Ignac Diosi and Son were in the wood processing business, and K.I. Deutsch operated a shop selling articles made from glass. There was also the business complex of Marton Leitner and Sons, the wholesale wine exchange of Mor Fuchsl, and the egg export business of Daniel Kolliner. The rights for the salt business were owned by Samuel Spitzer and Sons; the first modern funeral home was established by Adolf Veiszlovich and the first modern luxury hotel, the Parc Hotel, by his son, Emil Veiszlovich. Pioneers in the modern hotel and restaurant business counted Lipot Hillinger, Lajos Waldmann, and Sandor Stern. The first high style café, frequented by princes, nobility, and high-ranking hussars, was the Royal Café, established by Szidor Rendes. Other businessmen, among them Akos Popper, Miklos Szemere, and Mor Reismann were responsible for modernizing the banking system, the latter also having been one of the founders of the Commercial Hall, a palatial building which today houses the School of Medicine and Dentistry of the University of Oradea. Albert Stein created the first commercial brokerage, which later established relationships with most European businesses. Jeno Szekely opened the first movie house. Once the Jewish population as a whole became prosperous, they all donated to charity, as required by the laws of Judaism - according to their capabilities. The wealthiest from among them were responsible for creating a great variety of charities, which benefited the needy, and often not only those of Jewish faith. Various charitable societies, such as the Talmud Association, the Israelite Association for Helping the Needy Talmud Teachers, the Matrimonial Association, and The Jewish Association for Reciprocal Help, were religion oriented. Others, like the Association of Jewish Women, organized balls, brought to town visiting artists and spread modern culture. The funds they raised were spent on helping the needy - children and adults. Friends of the Children Society, the public kitchen, the charity organization for the orphaned children, and the creation of a trade school for girls were also among the charity work of the Jewish women. In addition, there were several private foundations established by wealthy Jews, such as Baroness Rothschild, nee Rozsika Wertheimstein of Bihor County, the families of Adolf Moskovits, Jakob Weinberger and many others. These foundations were not part of organized charity. The city's cultural life was also enhanced significantly by its Jewish population. Jewish youth had always shown a pronounced interest in acquiring knowledge and keeping up with modern culture. They had a passion for studying, and Jewish intellectuals were members of various cultural institutions in the city. They published at least 16 newspapers, established the Szigligeti Society - responsible for opening public libraries in the Velenta, Lower Fortress, and New City areas; the Association of the Friends of Music also organized plastic arts exhibits. The creation of the "Holnap" (Tomorrow) literary society marked an important step in the cultural life of the city. The seven founding members of this literary circle were renowned Hungarian authors Mihaly Babits, Endre Ady, Gyula Juhasz, Akos Dutka as well as Jewish writers Tamas Emod, Bela Balazs, and Jutka Miklos, its only female member. Along literary personalities, the Holnap society counted among its members accomplished Jewish artists Miklos Fleischer (poet Emod's brother) and Erno Tibor. The Hungarian periodical, "Hid" (Bridge), published several poems of the talented young poet Otto Emil (Otto Honig), student at Dr. Lipot Kecskemeti Jewish High School, who later perished in a death camp. From early on, Jewish men participated in civic duties, as members of the City Hall's various commissions, including Dr. Emil Adorjan, Dr. Samuel Friedlander, Dr. Ede Kurlander, Adolf Mihelfi, Dr. Lajos Mihelfi, and Dr. Zsigmond Sonnenfeld in the Judicial Committee. Dr. Ferenc Berkovits was President of the Oradea Bar. The Finances and Economics Committee functioned with Mor Aufricht, Dr. Ede Kurlander, Adolf Mihelfi, Mor Moskovits, and Dr. Jozsef Moskovits. Among others, Mor Reiszmann, Albert M. Steiner and Sandor Ullmann served on the Commerce and Industry Committee, while the Committee for Beautification and Infrastructure included Lajos Incze, Ede Heller, Miksa Moskovits, Nandor Hegedus, and others. On the Public Health Committee were Dr. Jakab Altmann, Dr. Marton Weismann, Chief of Police Armin Gero, and Dr. Erno Schiff. Chief Rabbi and poet Dr. Lipot Kecskemeti and Chief Rabbi Mor Fuchs were also among City Council members. At the turn of the 19th century, the population of the city had almost doubled and it was a natural consequence that building and rebuilding took gigantic proportions. The Jewish population, who until then lived in the outskirts of the city, found a new arena where to focus its strengths - esthetic creativity. Oradean Jews left their imprint is in the unique architectural ambiance which defines today's city. They achieved this as architects, builders, and financiers. It is difficult to define the architectural style of the city, as it is almost specific to Oradea. A modified art nouveau, referred to as Secessionist style, gives to this day a unique flavor to the city. Its main characteristics are intense ornamentation of the façade and walls, and of the spaces between windows, which are built in various shapes. The use of base-relief, decorations ranging from stone and marble to faience, from simple flowers and leaves to symbols, or plain geometric representations, offered the architects a possibility to freely express the fantasy of their own personality. Wrought iron and balconies were used both for practical and decorative purpose. David Busch, member of the Jewish community, held the office of Chief Engineer/Architect of the city. He brought several well-known architects of the time from far away, such as the Rimanoczys - father and son from Hungary--who were not Jewish builders, but were responsible for some of the best known constructions in the city. From Austria came the team of Fellner and Helmer, who projected the imposing theater in the center of downtown. Several Jewish architects originally from Bihor County, or who lived there, took part in the construction boom of this period, among them the internationally known brothers Laszlo and Jozsef Vago, Marcell Komor, Dezso Jakab, Nandor Bach, Jozsef Reisinger, Geza Markus, Vilmos Rendes, Jozsef Guttman, Frigyes Spiegel, and Ferenc Loble; and builders Lipot Incze, Lajos Incze, Gold &Co, and Miksa Schiffer. Intellectuals wealthy enough to finance some of the constructions included the following Jewish families: Adorjan, Ullmann, Weiszlovich, Deutsch, Moskovits, Stern, Fuchsl, Dr. Konrad, Okanyi-Schwartz, and Brull - some of whom commissioned buildings for their own use. These buildings were referred to as palaces. Several among these constructions still in use today include the Moskovits Palaces, the Vago House, the La Roche Darvas House, the School of Cadets (today University of Oradea), the Fuchsl Palace, the Okanyi-Schwartz Villa, the Stern Palace, the Adorjan Palaces, the Sonnenfeld Building, the Ullmann Palace. The two large synagogues - the Zion Neolog Temple designed by David Busch and built by Kalman Rimanoczy, Sr. and the Great Orthodox Synagogue by Nandor Bach - were built during this period. The eclectic Black Eagle Palace is perhaps the most unusual building in Oradea. Designed by Marcell Komor and Dezso Jakab, and financed by Dr. Emil Adorjan and Dr. Ede Kurlander, it consists of a complex of several multi-story buildings which house a great number of stores on the ground level and apartment dwellings on the upper floors, along with two theaters and a hotel. Its interior passage, in an asymmetric Y shape, is covered completely by skylight and the structure has entrances from three streets. The image of a black eagle etched in stain glass, made by the K. Neuman firm in 1909 appears in two large areas of the skylight. This author thinks the Black Eagle complex is a smaller version of the Galleria Vittorio Emanuele II in Milan, Italy. 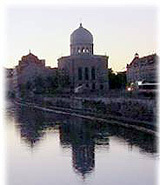 By peacefully cooperating with ethnic groups, through dedication and hard work, the Jewish population contributed a great deal prior to World War I and between the two wars as well as after World War II to make Oradea, the city once referred to as the "Paris of the Cris River banks" become a modern city economically, commercially, industrially, and culturally. "Istoria orasului Oradea" (Chapter by Tereza Mozes: Comunitatea evreiasca), Muzeul Tarii Crisurilor, Oradea, 1996. Given the bilingual nature of the city, I gave both Hungarian and Romanian equivalents to the names of places when I mentioned them for the first time. Where possible and/or necessary, I also provided an English translation. I have omitted the use of diacritical marks over or under letters in the text, as these fonts were not available in my word processor. Prior to the deportation of the Jews of Oradea / Nagyvarad, the acting mayor of the city circulated a memo listing all Jewish businesses in the town. As reported by Susan Geroe, the mayor of Oradea, Dr. Istvan Soos, handed in his resignation before April 1944 because he refused to sign the deportation orders. Acting mayor Gyapai took over. Parenthetically, Andras Soos, the mayor's brother, was the director of the City Library. Susan Geroe notes that handwritten lists that he made up were retrieved from the Oradea Archives. These lists of Jewish borrowers, including name, address, and occupation, were submitted to Budapest. It is not clear who circulated these lists. Five lists of businesses, differentiated by size, were created, which included the name of the owner, profession, and the address of the business. The police were directed to confiscate the contents of these businesses. As best as can be determined, the lists were prepared between March 19 and July 9, 1944; but no precise date is available. This database, with a total of 1,555 entries, combines the information from all five lists. The data is from the United States Holocaust Memorial Museum, RG #52.003.01*01, the Braham Collection. There are no other name lists in this collection, but it does include some eyewitness accounts. Page Number -- Page numbers are preceded by the letters A through E, representing the 5 individual lists. Status / Title -- Where applicable, this field generally has either "Dr." or "özv. "/"özvegy", which means widow. Occupation -- The glossary contains the translation of terms used in this database. Please also refer to the JewishGen InfoFile for translations of the Hungarian occupations. We are in the process of revising this file and the glossary will be added to the InfoFile during this revision. The information contained in this database was indexed from the files of the United States Holocaust Memorial Museum (RG 52.003.01*01), the Braham Collection. This information is accessible to you today thanks to the efforts of the following JewishGen volunteers: Nolan Altman (Coordinator) and Kurt Friedlaender, who did the data entry. Susan Geroe kindly wrote the background section and Nolan Altman wrote the remainder of the Introduction explaining the database itself.